These little “white fudge” pieces are full of orange and coconut flavor and sweetened with a mild honey. My two year old daughter loves them! Because they aren’t overly sweet, I feel that they are a great treat to give her. The other great thing about them is that they are a wonderful treat for kids (or adults!) on special diets. And that’s what the Cooking to Heal DVD set it all about it. Julie Mathews, who blogs at Nourishing Hope, is a autism diet and nutrition specialist and Defeat Autism Now! practitioner. 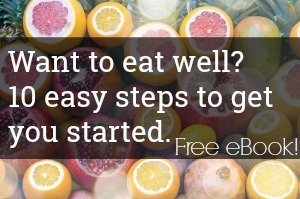 She’s put together a DVD and workbook set for those interested in learning how to cook to heal. Topics included: Explanation of different healing diets (SCD, Body Ecology, Low Oxalate Diet etc) Nutrient Dense Foods, Soaking and Fermenting Seeds, Desserts, Fermented Foods, plus tips on everything from how to hide liver into ground beef, and what to feed a vegetable adverse child. I think that this set would be of great help to someone who needed an intro to healing food as it gives a great overview. She also wrote a book discussing the different healing diets, for those who need to get a picture of what the different diets are like without having to buy all of the books. Special diet or not, we all enjoyed this white fudge! If desired, baking extract such as orange extract vanilla extract or citrus oils. Orange or lemon rind (for fruit extracts). (I used a tablespoon of orange zest). Add coconut butter to food processor and chop up into fine chunks. Melt coconut oil (not too hot) and add to food processor while spinning. Slowly add honey and extract/rind. Taste as you go to achieve desired sweetness. Place waxed paper on cookie sheet. Scoop mixture onto paper and spread thinly )1/3 -1/2 inch) and put pan in refrigerator to chill. Take out and cut into small 1/2 inch squares. Peel off paper and store in airtight container in the refrigerator. *Recipe used with permission Special thanks for the review copy of Cooking to Heal. Is coconut butter different from coconut oil? I did not know! Now, I will have to find some! This looks really great and easy to make. Thanks for sharing. From what I see at WFN website, coconut spread is different from coconut cream. I have a good bit of Tropical Traditions Creamed Coconut that I bought while it was on a super sale. Do you think that would work in place of the coconut spread? This looks delicious and absolutely a great way to more of the goodness of coconut into the diet. Coconut butter, or coconut spread is made from the whole coconuts, rather than just the oil. It has a thicker, more dense texture. wow, so i can eat this and heal?! love it!! What a beautiful recipe! I am always on the lookout for sweet treats for my kiddo. I am really enjoying your web site and learning alot. I just was at New Seasons this morning and speaking of sweet treats, they had an icecream made out of HEMP SEED. They told me it is the perfect food, even more so than FlAX SEED. Thought I would ask you if you have researched this before. Also, really appreciated your comments on sweeteners. My husband is pre diabetic and I am trying other sweeteners for our family. It really helped. Oh how yummy and easy this recipe looks! I have all of the ingredients so I will have to make it in the morning. I use coconut butter to make other raw desserts. This one looks so fancy with the flecks of orange! I just went to the website, Nourishing Hope. I look forward to reading more abut it. My husband is also a DAN practitioner. It’s nice to have the CC texture to chew through as an alternative to EVCO bark. Love this simple and yummy recipe! I have made this recipe before and everyone loved it. Has anyone ever used this as a cake frosting? Or do you have a cake frosting recipe using coconut butter? Simple, yummy recipe. I replaced the orange with lime zest and lime juice to make ‘Key Lime Pie’ fudge. This treat is a great substitute for super sugary boardwalk summer fudge too! This was so easy and very tasty. I used coconut butter, stevia, lemon extract and half of a lemon zested (no juice). What I liked the best was how fast it was to make. Being a traditional cook, most dishes take forever to make. Next, I will replace the lemon zest with raspberries. Thanks for sharing.